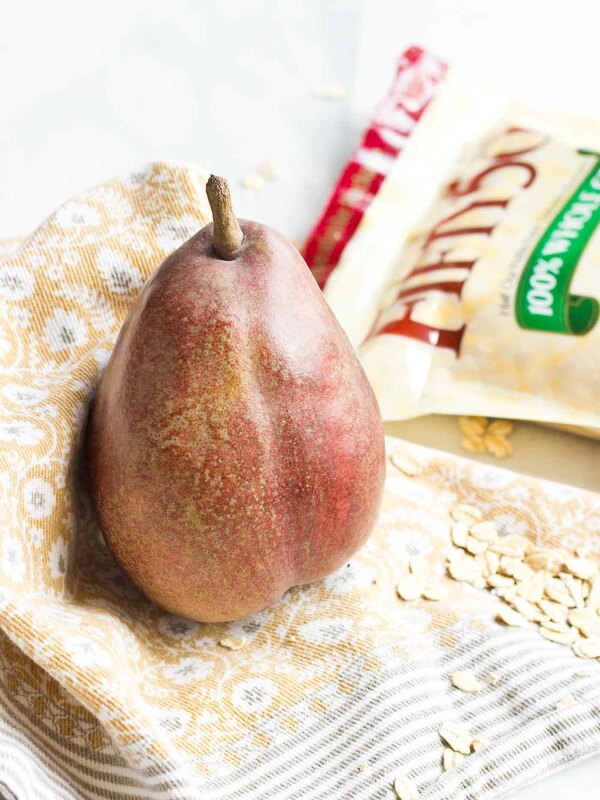 This Caramelized Pear Oatmeal recipe post is sponsored by Fifty50 Foods as part of their #Fifty50Foods4Diabetes campaign with Megan Media. 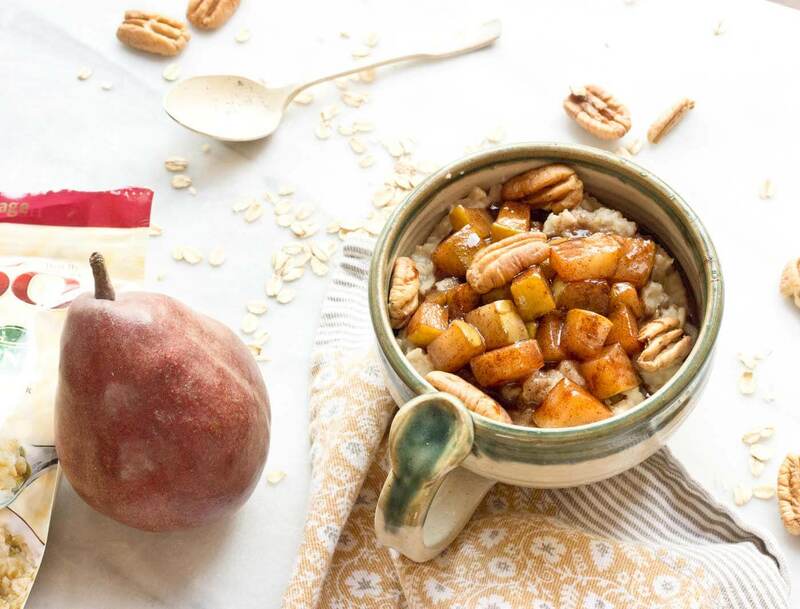 I know, I made you a pear recipe yesterday, but I can’t get enough of this Caramelized Pear Oatmeal. It’s all cinnamon-y and warm and comforting, especially on a chilly fall weekend! YAY!! I’ve been dreaming of colder weather all year long and it’s finally here, well maybe only for a few days (or hours)..and not chilly enough to dress in a cozy sweater and long pants, but that’s the reality of my Florida living but I’ll take whatever I can get… even if it is wearing blue jeans and a t-shirt and letting the breeze hit my face. Oh and you better bet I’ve been wearing my boots. Boot weather is here!!! 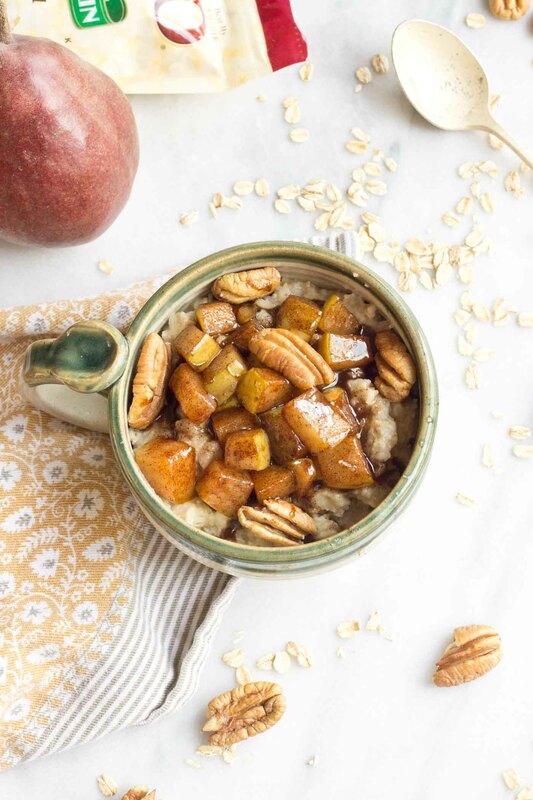 Since it’s National Diabetes Month, I partnered with Fifty50 Foods to bring you this recipe for Caramelized Pear Oatmeal. 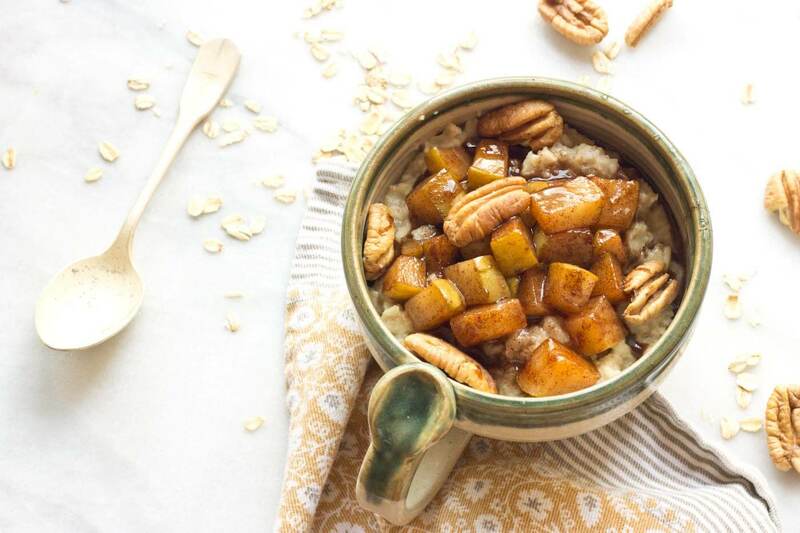 In this recipe I’m featuring their Low Glycemic Hearty Cut Oatmeal made with 100% whole grain rolled oats. In case you’re wondering, a Low Glycemic diet provides a slow and steady supply of blood sugar, so you don’t get the rapid spikes which is important for people with diabetes but really this is how we should all eat IMHO. 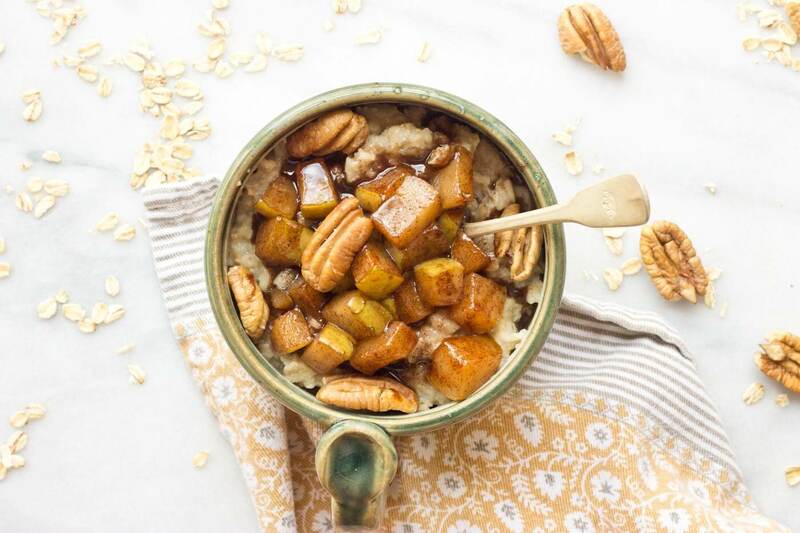 Aside from the great taste of oatmeal, I love that Fifty50 Foods donates half of their profits to fund diabetes research – 13.6 million dollars to date! This hits close to home and is important to me because most of my extended family members have diabetes. All six of my mom’s siblings have struggled with diabetes from a young age and both of my dad’s brothers had diabetes. All eight out of nine of my aunts and uncles have/had diabetes! Crazy and sad right? Ugh, living with diabetes is so hard. Luckily my parents are nearing their 60s and have been spared, but diabetes is a reality that I’ve grown up with so keeping a healthy low glycemic diet to hopefully prevent diabetes hits close to home. 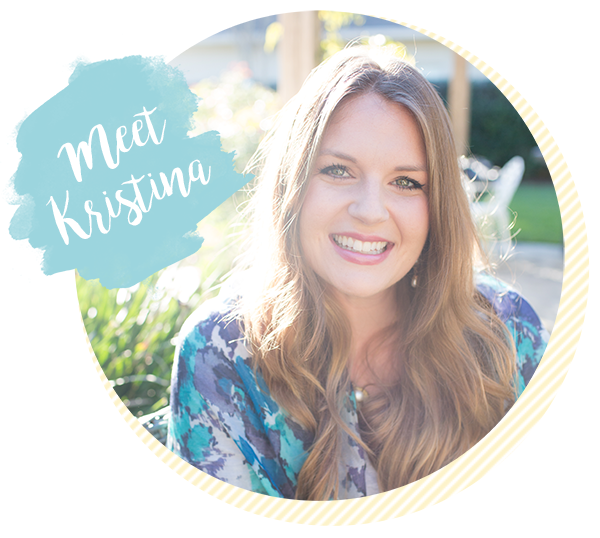 Eating Fifty50 Foods is more than just a way to control blood sugar, it’s a way to help find a cure for diabetes. 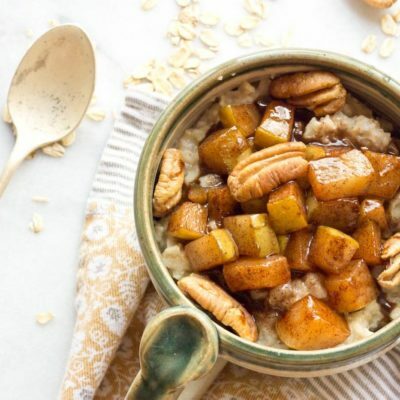 And what a better way to do that than to eat this Caramelized Pear Oatmeal?? 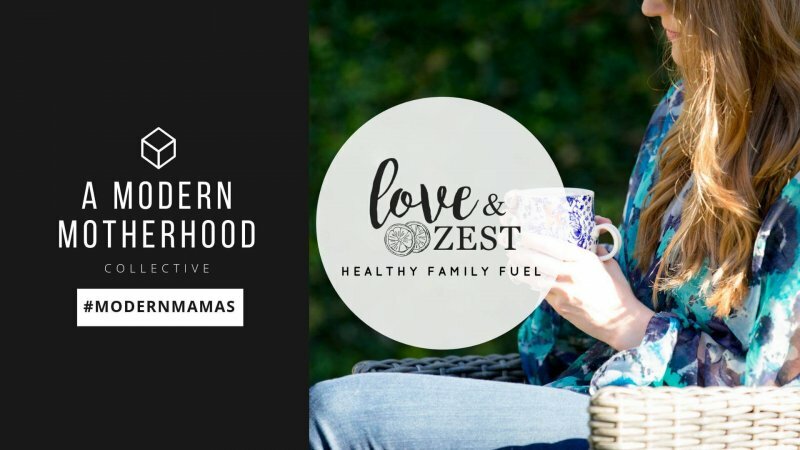 You can support the cause and find low glycemic products in Fifty50 Foods online marketplace. Fifty50 Foods has a line of 23 Low Glycemic products, perfect for anyone managing blood sugar levels, including peanut butters, fruit spreads, whole-grain oatmeal, maple syrup, pie crust, chocolate bars, crème filled wafers, cookies and hard candies. Does anyone in your family have diabetes? 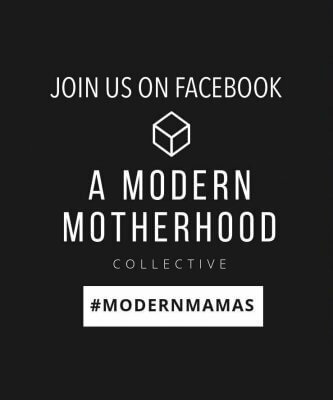 Please comment below, I’d love to hear from you. 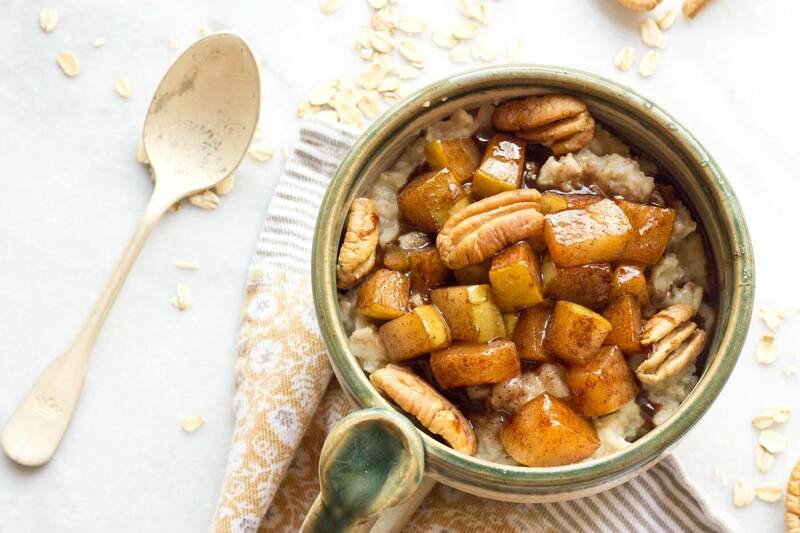 I can’t get enough of this Caramelized Pear Oatmeal. It’s all cinnamon-y and warm and comforting, especially on a chilly fall morning! YAY!! Prepare oatmeal according to package directions. Once cooked, stir in ground flaxseed. In a cast iron skillet, heat coconut oil and maple syrup over medium heat and cook until bubbly. Stir in pears and cinnamon and cover with a lid for about 10 to steam and soften pears. Remove lid and cook for a few more minutes to caramelize pears. 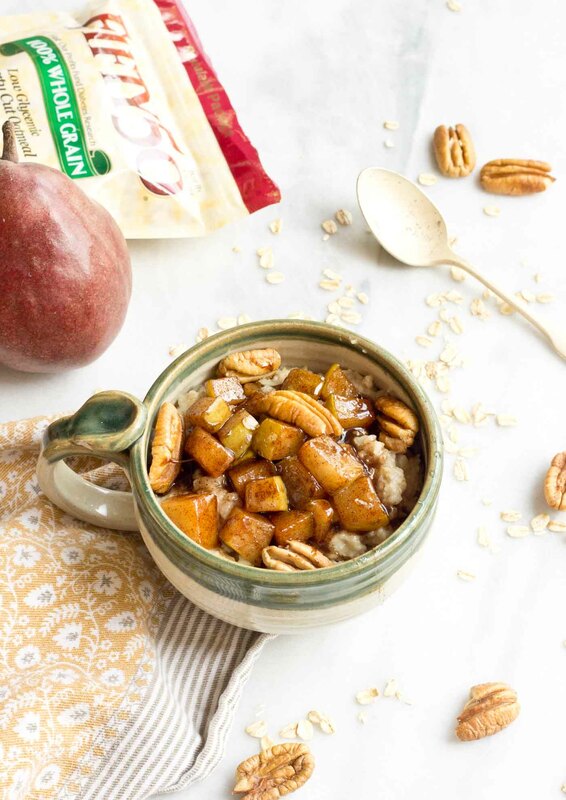 Divide oatmeal into two bowls and top with pears and any additional toppings like pecans or nut butter. I am so happy that I found this recipe. The oatmeal dish cooked beautifully. It tasted delicious and smelled lovely. I will continue to make this oatmeal on the regular for breakfast. Thanks for sharing. What a beautiful and delicious way to start you day. Full of flavour…and would also be a great brunch item for the weekend. What a lovely breakfast dish. pears in caramel are delicious. I may make this soon! I usually hate oatmeal, but that is something I could definitely see myself eating. Looks more like dessert to me! I love the health benefits of oatmeal and am always looking for new ways to fix it. I do enjoy pears as well ao I think I will have to make this! I love oatmeal in the mornings!! I never had with caramelized pears… Looks delicious! !